Vicki’s Tap Pups make great noise together. 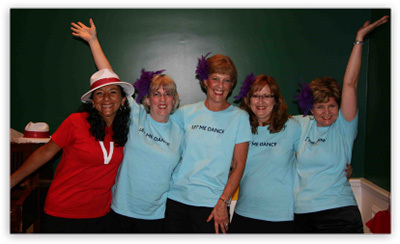 Whether it’s the sound from their signature black-and-white tap shoes, the laughter of new friendships or the awareness they raise for single mothers in the community, America’s largest adult tap group certainly knows how to have fun. 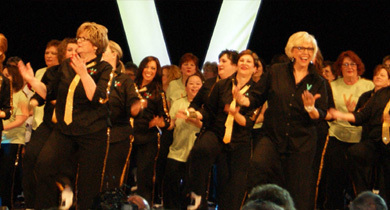 Vicki’s Tap Pups is an adult-only tap dance program based in Lemoyne, PA (minutes from Harrisburg & Hershey) with over 500 women and men ranging in ages from 21-86, with the average age being 57. There are currently 7 levels of tap in the program to accommodate every level of dancer from the absolute beginner to the most advanced. 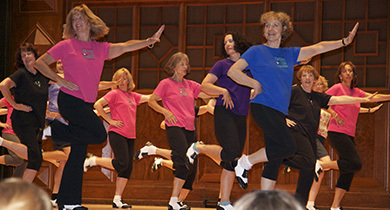 Created by Vicki G. Riordan, 66 years old and a proud baby boomer, her Tap Pups program reflects her strong dance philosophy of serious technique mixed with an obvious dose of fun, which is why her program continues to grow every year. 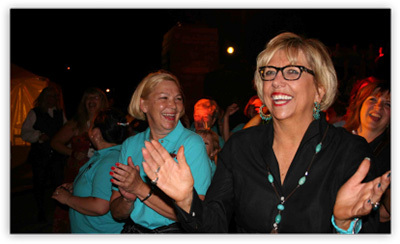 Vicki G. Riordan started a small adult tap dancing class in 1997 with just 17 women and men in an elementary school cafeteria. 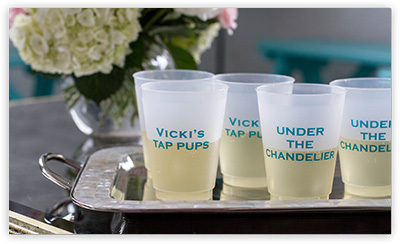 Since then, Vicki’s Tap Pups has not only grown in size, but also in the strength of the community it has created. Most Tap Pups originally thought they were just signing up for a tap class, but soon realized that this dance program is so much more than tap. There’s a strong power when like-minded people come together, that’s why Vicki’s Tap Pups is not only about finding rhythm on the dance floor, but also finding a new sense of rhythm in life. No prior tap experience. In this level, you will learn my “Back-to-Basics” program to ensure that every step and combination you will learn will be as clean and smooth as possible. Slaps, Shuffles, Shuffle Ball Change, the Tap Pups signature 3&2s, Riffs. At least one year of recent tap experience. Back-to-Basics, first time step, shuffle-off-to-Buffalo, waltz clog, shim-sham shimmy, advanced riffs. At least two or more years of recent tap experience. All of New Beginner and Beginner 1 steps, soft shoe, plus two time steps. At least three years or more of recent tap experience. Should have a strong knowledge of most of the lower level steps. All six time steps, and fast moving dances with more advanced combinations. Experienced tap dancer. You need to have tapped for quite a few years. Strong knowledge of most of the basic steps is a must. Able to move with ease as we will touch on pick-ups and all time steps. Call Vicki to discuss your level. This is an extremely fast-paced class and you will need to be able to move your feet in order to keep up. 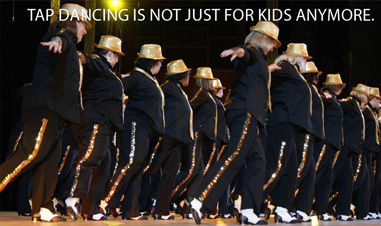 Tap Dancing Isn’t Just for Kids Any More. Vicki’s philosophy mixes a unique blend of serious technique with everyday life experience to help adults not just learn, but to relate to her classes. She has a highly effective ability to infuse just the right level of fun to the program that keeps her students coming back year after year. Vicki’s classic-style-choreography helps to create a sense of reinvention that lets her students feel extremely relevant in today’s youth-oriented-pop-culture society. When children take dance classes, most times they are dragged in by the hand of their parent. When Vicki’s adult students come in for their first class, they carry their new dance shoes in with pride. The Four words you've waited a lifetime to hear. Vicki’s Tap Pups Studio & Cultural Center located in Lemoyne, Pennsylvania opened its doors in August 2008 and has easily become the loudest place in Central Pennsylvania, if not America. The state-of-the-art dance studio, once an 1800’s horse stable, mixes styles of French antique with industrial loft, creating a sophisticated, yet fun place for the Tap Pups to dance, hang out and of course make a ton of noise. 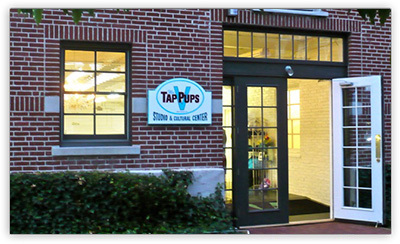 The studio serves as the national headquarters for the Vicki’s Tap Pups program where Vicki’s proprietary and unique adult tap program is taught to over 500 dancers of all levels of the program from new beginners to advanced. The lounge in the studio was carefully designed to create a chic and hip place for the Tap Pups to hang out before and after classes. The conversations range from family, career, movies, relationships – nothing is off limits! And from time to time, Vicki brings out a favorite bottle of wine for the group as they dish the latest scoop. Ever since Vicki started her Tap Pups program in 1997, she made sure her dancers had the opportunity to show their friends and family just what they’ve been up to every week. What began as simply allowing a small, “safe” group into the last class of the year before the summer break, turned into a full-blown annual event that attracts almost 1700 people from around the state of PA. The core essence of the annual spring show remains the same today as it did when they were held in the elementary school cafeteria where Vicki used to teach classes – it’s all about letting that inner-fabulous out! All to help the Tap Pups shine. Every spring show features all levels of dancers and has a unique theme that helps the audience to understand just how the Tap Pups feel. Past themes have been, “It’s Time to Make Noise”, “Finding Our Rhythm” and “Encore Performance: The Show” – the theme of last year’s show. It is not required for every Tap Pup to participate in the show, but usually over 200 of the dancers participate. 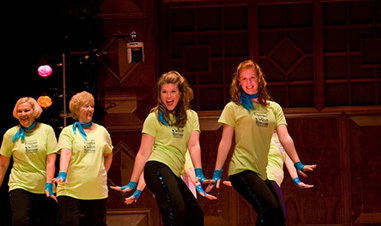 Even though the average age of the participants are the age of grandmothers, there are a lot of younger, (equally as fabulous) tappers in their 20’s, 30’s and 40’s who perform. The mix of ages and levels truly makes the show unique and exciting.